Thank you for visiting Nabedana Kouzaki Brewery. As you may know, SAKE has played a central role in the life and culture of Japanese people for about two thousand years, during which time the knowledge and skills required for SAKE production have spread to every region of the country. Although the number of breweries has drastically decreased for the last 50 years, today there are some 1,500 breweries of all sizes are still engaged in the production of SAKE, Japan’s national alcoholic beverage. We hope you enjoy your visit and learn what SAKE is all about and how JINYU is brewed. 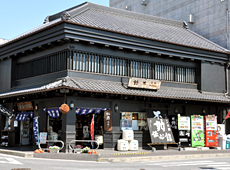 Our ancestors have started brewing SAKE in NARITA by NARITASAN Temple more than 320 years ago in a period called EDO, the era of TOKUGAWA SHOGUNATE. The brewing license, at first, was given by a local lord, and the Narita brewery was the only production facility site for the first 200 years of our history. As brewing business went on and well, we were able to expand the business by acquiring other production facilities. One of them was this Kouzaki brewery, acquired in 1897. Later we maintained four production sites at one time including the one in Kobe, but unfortunately, in the beginning of World War II, due to the severe rice shortage, we were forced to choose one production site and close the others. Consequently we chose Kouzaki. The reasons were that Kouzaki site was the biggest in terms of square, had a relatively better access to rice at the time, and had abundant water in good quality, all compared to others. Since then, we have been brewing JINYU, our main brand, for the last few decades at the Kouzaki brewery. 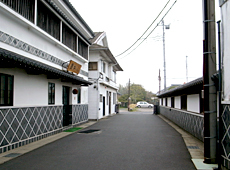 We have made brewing the finest sake a family tradition for more than 3 centuries. Our brewing motto, “never compromise” has been passed on to more than 19 generations. SAKE is made primarily from rice and water interacting with microbes known as Koji and SAKE Yeast. Although SAKE is defined as a brewed alcohol, the brewing process is more complex and delicate than that of wine and beer. 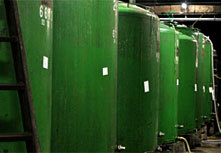 In the wine production process, the crushed grapes ferment naturally after yeast is added. 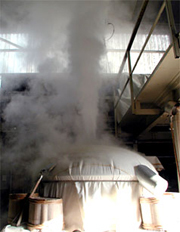 In the case of beer, fermentation takes place after yeast and hot water are added to crushed malt. But the rice used to make SAKE does not begin to ferment with the addition of yeast alone. SAKE brewing begins with the introduction of Koji, which break down rice starch into glucose in a process known as “saccharification.” Next, SAKE yeast is added and fermentation begins. 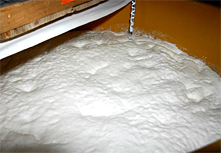 This process, in which saccharification and fermentation take place in the same vat at the same time, is called “Multiple Parallel Fermentation.” This is a unique feature of SAKE brewing that distinguishes it from other brewing processes. In order to obtain as pure starch as possible, rice is polished up to 35% of its original size, therefore getting rid of unnecessary ingredients such as protein and fat. Polishing rice takes up to 80 hours depending on the types of SAKE we brew. The average water content of rice is about 12 to 13%, but since each lot of rice, being different kind and having different milling ratio, has different water content to begin with. So we need to vary soaking time to have the correct water content, around 30% to be exact. 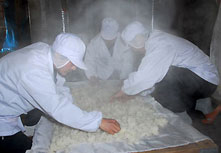 Rice steaming is very vital for the next process of Koji making. For the Koji microbes to function smoothly and vigorously, rice should be steamed just right, not over- or under-steamed. Koji are microbes(fungi), similar to those used in blue cheese production, that have been known good for the health from ancient times. SHOYU(soy sauce) and MISO(soy bean paste) are also produced using similar beneficial Koji. 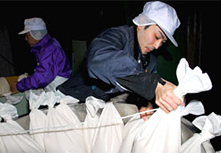 Koji rice are made by sprinkling Koji fungi over steamed rice, and letting the rice sit for 48 hours at the temperature of 33 – 40 degrees C.
During this period, Koji starts to produce more than 100 different types of enzymes of which two are very important in SAKE making. The first enzyme is PROTEASE which helps dissolve rice and second one is AMYLASE which dissolves starch and transforms it into GLUCOSE(sugar). Before making a big batch of culture, we start with the small amount of culture called Shubo (fermentation starter). Shubo is made by adding Koji rice, steamed rice, SAKE yeast and lactic acid into purified water. It takes about 14 days before it gets mature enough to go on to the next fermentation stage. 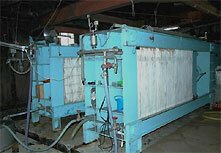 The main purpose of having Shubo is to increase the number of SAKE yeast in the liquid. The number will exceed well over 300 million per 1 cubic centimeter during a 14-day period. 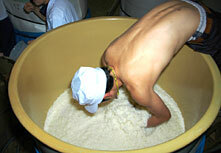 Shubo as a base, we keep adding more Koji rice, steamed rice, and purified water in 3 steps to make Moromi. All steps take 20 to 35 days when the level of alcohol in Moromi reaches the right point. Using a bellows like filter, we filter Moromi to get clear SAKE. Not like wine or beer, SAKE is not permitted to have any preservatives whatsoever. Instead we pasteurize SAKE at 62 degrees C to make all microbes inactive before we store SAKE. © NABEDANA INC. All Right Reserved.